Four volunteers sign up for what initially appears to be a typical paid research study, only to discover that they've unwittingly become involved with a classified government program that was said to have been terminated nearly two decades ago, in this tense psychological thriller from director Jonathan Liebesman. The allure of a little extra cash proving too powerful to resist, four strangers decide to partake in a paid research study. As the study gets underway, the group is presented with a series of questions, and given a finite window of time in which each individual member must submit a unique numerical answer. At first, the participants all assume that the subject who gives the most obviously incorrect answer will be removed from the experiment, though it doesn't take long for the group to realize that the correct answer isn't always the answer that the researchers are looking for. 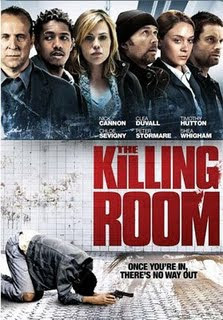 Meanwhile, as the brooding Dr. Phillips (Peter Stormare) attempts to manipulate the study to get the answers he wants, the newest member of his team, military psychologist Ms. Reilly (Chloe Sevigny) begins questioning the ethics of such a diabolical experiment.